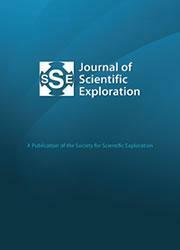 Charles Paxton has written on the statistics of aquatic cryptids before and has had a new paper published in the latest issue of the Journal of Scientific Exploration (Volume 30, Number 1). You have to become a paid up member of the Society for Scientific Exploration to access the article or wait two years for it to become free. I did get a copy from Charles having helped him on this article, so can make a few points. Little work has been undertaken on the consistency/repeatability of reports of natural historical anomalies. Such information is useful in understanding the reporting process associated with such accounts and distinguishing any underlying biological signal. Here we used intraclass correlation as a measure of consistency in descriptions of a variety of quantitative features from a large collection of firsthand accounts of apparently unknown aquatic animals (hereafter “monsters”) in each of two different cases. In the first case, same observer, same encounter (sose), the correlation was estimated from two different accounts of the same event from the same witness. In the second case, the correlation was between two different observers of the same event (dose). Overall, levels of consistency were surprisingly high, with length of monster, distance of monster to the witness, and duration of encounter varying between 0.63 and 1. Interestingly, there was no evidence that sose accounts generally had higher consistency than dose accounts. If you don't read the article, the one thing to take away from the abstract is the consistency between estimates of distance and size between multiple witnesses and multiple witness accounts. That, of course, does not equate to accuracy, but neither does it exclude it. Though there will be caveats, this can be taken as a positive for witness integrity rather than a negative. I say this because a low precision would not be consistent with high accuracy. Charles' study used a dataset which was a combination of sea and lake monster reports. It would be interesting to see further results for the single case of the Loch Ness Monster. Note that this does not address the other issue of witness descriptions of what they see, which is a more complex affair than estimating a simple number. On the cryptozoological theme, I note the same issue carries a review of a new by Karl Shuker entitled: "A Manifestation of Monsters: Examining the (Un)usual Suspects" and it is reviewed by a man well known to Nessie researchers, Henry Bauer. 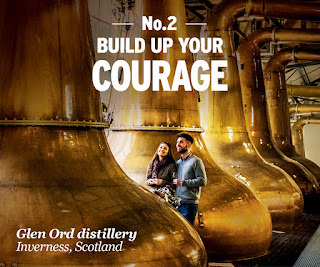 After trying to ignore the Loch Ness Monster for years and diverting potential tourists to other attractions around the area, the tourist agency, VisitBritain, has decided to recruit the monster into their services with a promotion drive in France, Holland and the USA. 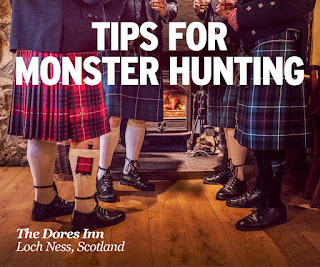 The ad campaign cleverly uses some themes of monster hunting as a route into promoting other aspects of Highland tourism. 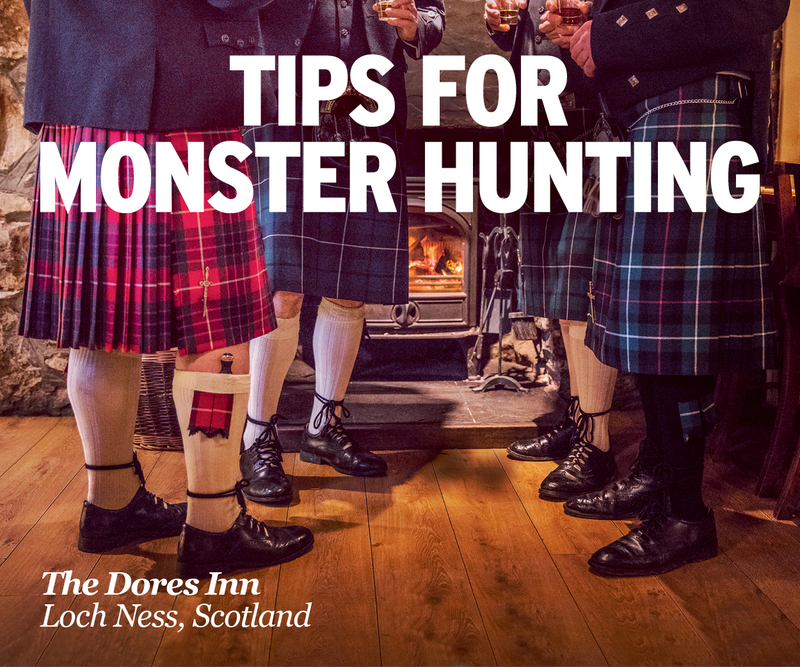 Back in 2008, a bid to make the Loch Ness area a UNESCO world heritage site carefully ensured no mention of the monster was made. One would have also thought the repeated attempts of sceptics to reduce the mysterious creature to logs, waves, birds and liars would have had its effect. Evidently not, people still like monsters while bow waves and cormorants don't cut the mustard. 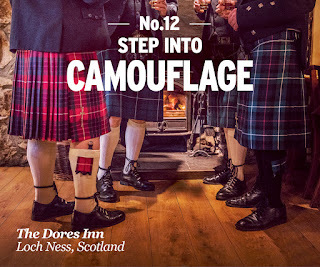 From my own point of view, I am ambivalent about increased tourism around the loch. The increased traffic noise on the loch is, in my opinion, a deterrent to the creatures surfacing. 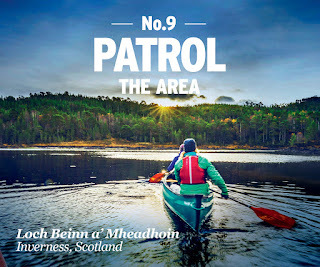 That doesn't mean they never surface near boats, it just means that as the noise coverage over the loch increases, open water sightings proportionally decrease. For me, it also makes it more difficult to find secluded spots for trap cameras as tourists like to clamber along the shore lines. On the other hand, more tourists means more potential videos and photographs - assuming this is not cancelled by the increased noise. Oh well, maybe I should only come up in the winter. 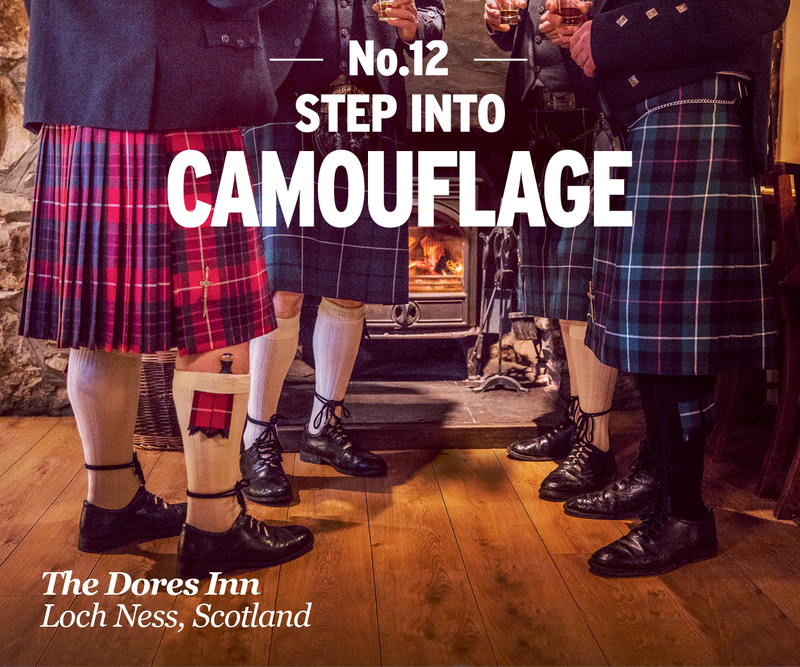 This blog has brought you Rip Hepple's Nessletters and Tim Dinsdale's Operations newsletters. Now it is the turn of Frank Searle. Back in 1969, Frank Searle arrived at Loch Ness with nothing more than a camera, a tent and a lot of hope. Seven years and several alleged monster photos later, he was elevated to the status of famous monster hunter which led to the publication of his book and the start of a quarterly newsletter sent out to a crowd of subscribers. I haven't read all the newsletters, but they tend to start with Frank's own investigations as well as stories of other sightings from those who came to his camp. As the years pass by, the tone changes as he begins to criticise the activities of the media, commercial operations and other investigators. 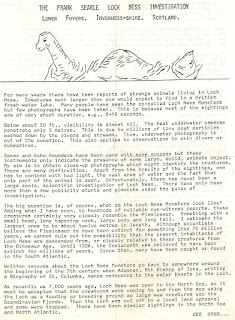 The last newsletter is dated December 1983 as he announces his impending departure from the loch. 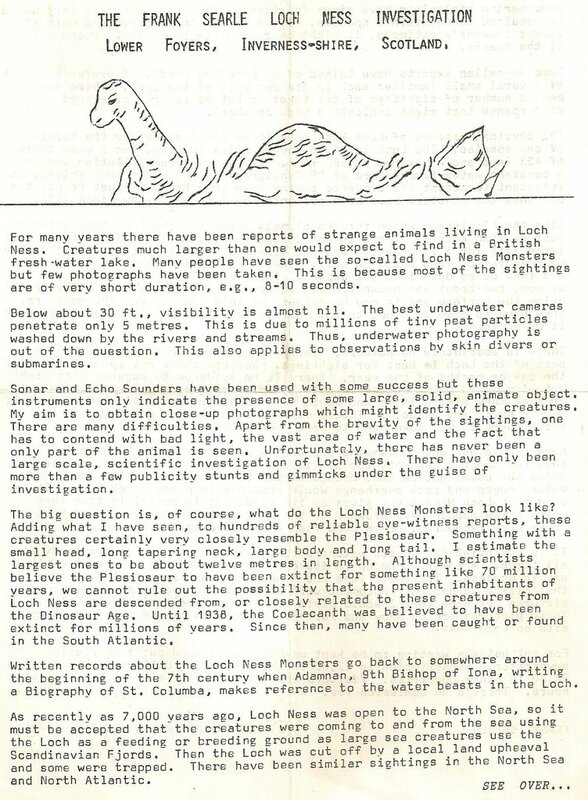 This final newsletter was published between the "petrol bomb" attack on Adrian Shine's boats and the fire at the Loch Ness exhibition that Frank Searle so hated. The newsletter roster is incomplete as it lacks the issues for December 1981, all of 1982 and March 1983. The issue for 1976 is undated, so I am uncertain what may be missing for 1976 or whether the presumed missing dates elsewhere were actually published. If readers have any missing issues, feel free to send me scanned copies for inclusion. The archive can be explored at this link.